So you’ve got yourself an excellent yoga mat. It fits you right, it’s non-slip, and the color is just what you were looking for. But unless you are Parvati goddess with many arms, then carrying your mat, a water bottle, changing clothes, a purse with valuables, and maybe some additional props for the class is no mean feat. Luckily, there are a variety of yoga mat carriers on the market to make your life easier. We have reviewed top yoga mat bags and carriers of different design, style, and price range: from cheap and minimalist to multi-purpose yoga bags for true yoga buffs and made a list of 7 best items to help you choose the yoga mat bag that will perfectly meet your needs. Also check out our comprehensive shopping guides and reviews for the best yoga mats, hot yoga towels, yoga blocks, yoga straps, yoga pants for women, yoga pants for men, yoga bolsters, yoga wheels, non-slip grip socks. Meet our top pick – a multi-purpose yoga mat bag made of durable water-repellent and stain-resistant material. The bag is simple to use, easy to clean and has enough space to hold your yoga mat, clothes, and other essentials. All yoga mat carriers can look the same to you. But there are subtle differences that can make the yoga bag a great favorite of yours or leave it to gather dust in the closet after purchase. So don’t throw your money away and make sure to do the following things before getting the yoga mat bag. Most of the bags in the market will fit standard yoga mats (68’’L x 24’’W). But don’t be lazy and check the measurements of the bag you set sights on so that you wouldn’t sweat to squeeze your yoga mat into it after the class or when in a hurry. Those who have extra thick or extra long yoga mats should be even more attentive as many bags are just not suitable to carry your heavy Manduka Pro XL. They will either break sooner than expected or simply won’t fit. 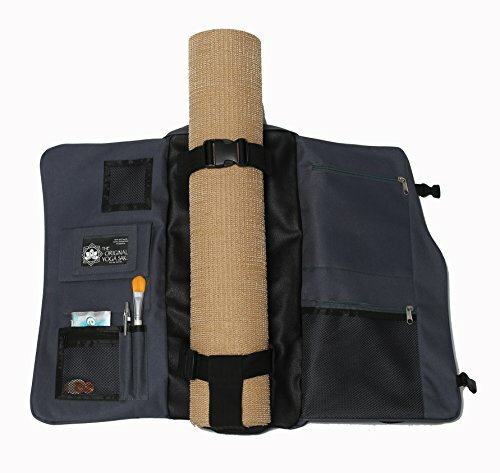 Do you need a simple and minimalist yoga mat carrier or a multi-purpose bag that can fit your valuables, clothes, towel, water bottle, yoga block, and perhaps even a tablet? Do you often cycle to your yoga class? Do you maybe have pains in your back and prefer to carry a backpack-style mat carrier instead of a large horizontal one shoulder tote bag? Figuring out what you need first and then narrowing down the choice to what is most convenient for you will save you hours of time. The yoga mat bag should be made of durable material which will serve you for many years. Ideally, it should be water- and stain-resistant to protect your mat and personal belongings. If you’re practicing hot yoga or sweating a lot during the class, then breathable material or special ventilation for clothes and mat is essential to prevent the stinky smell and bacterial growth. 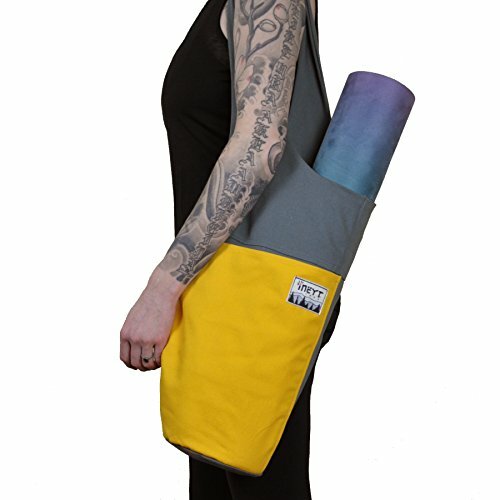 Yoga mat carriers can come with or without pockets. The pockets can be located on the outside, hidden inside of the bag, secured by a zip, a Velcro or a magnetic snap. If you want to leave your purse at home when going to a studio, then choose mat carriers with secure zipped pockets, where you can store your keys, money or ID. Some bags come with padded pouches or a spacey compartment for your tablet or laptop if you’re checking in your yoga class right after or before work. Yoga mat bags can come with two short straps or a long shoulder- or cross-body strap. A big plus is when the straps are adjustable to fit your body size and padded to prevent them from butting against your skin when carrying a heavy mat. 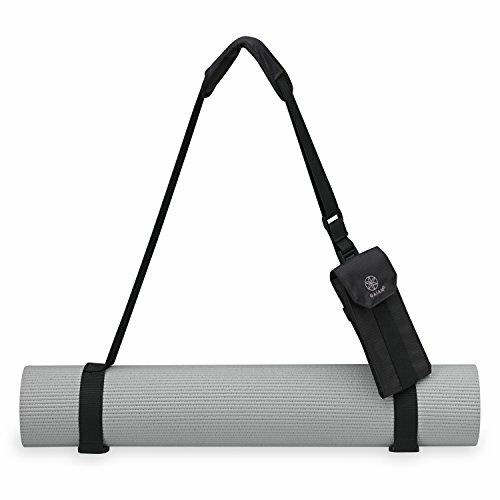 SIMPLE, CLASSIC DESIGN: Comfortable, lightweight yoga sling for your yoga mat and accessories. Dimensions suitable for all standard yoga mats. Longer strap to accommodate more body types. Your yoga mat will feel well balanced on your shoulder. Say goodbye to bulky, uncomfortable bags with a yoga mat bag built to suit your personal needs! INTERIOR PERFECT SIZE : In addition to a roomy mat interior pocket, our yoga sling has an additional compartment for accessories with an additional zippered pocket for secure storage of phone, glasses, wallet, etc. You'll also find a small leash keychain, so you can find your keys quickly and easily. Yoga Sling Bag offers an inexpensive and stylish solution for toting your yoga mat around the town. It’s made of durable canvas and is available in 6 different color schemes. The bag is ultra lightweight and compact. It has a large interior space for the yoga mat and a second pocket for personal items. There’s a small zippered pocket for secure storage of your phone, wallet, or glasses. As a nice addition, there’s a small leash keychain so you can always know where your keys are. Yoga Sling Bag is multi-functional. Apart from storing your yoga mat, it can be used as a shopping bag when you pop out to a grocery store or as a beach bag. 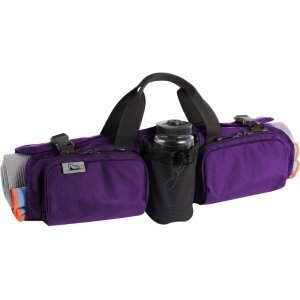 On the downside, Yoga Sling Bag is not big enough if you have lots of yoga accessories and want to bring them with you to the studio. The strap is non-adjustable. It is made to hand off a shoulder and can’t be carried across the body. The bag is also not high enough to cover the top of your yoga mat and doesn’t protect it from the rain. Gaiam Sling is designed for minimalists in mind. It offers a simple solution for those who don’t typically lug around all yoga props and accessories with them to the studio. The sling fits small to medium yoga mats and comes with a detachable front pocket for keys or phone. Obviously, Gaiam sling doesn’t provide any protection for your mat from rain or dirt. It might also be hard to adjust the clips and line up the straps at first or when you’re in a hurry. Backpack and bike fans will probably take a liking to Yoga Sak at a glance. This is also an excellent choice for those who care that the weight they carry around all day is not skewed to one of the sides. Yoga Sak has two shoulder straps and can be worn as a backpack. It is designed so that the yoga mat (of any thickness and width), which is usually the heaviest item, is placed in the center and covered by two flaps. There are two straps inside of the bag which secure the mat and a hidden pocket at the bottom for additional mat support. Yoga Sak holds the mat upright whereas the majority of backpacks on the market hold the mat either horizontally or sticking out at an angle. It makes the bag comfortable to carry even if you bike to your yoga sessions. Apart from the mat, the bag has plenty of space for additional gear. The rear compartment can fit a yoga block, a strap, changing clothes and shoes, a towel, etc. There are separate small pockets for your valuables, such as ID, keys, cell phone, iPod, wallet, and even a hidden mesh pocket for your water bottle. Made of polyester, Yoga Sak is lightweight and pretty durable as long as you don’t use it for carrying heavy items over long distances. The Zenifit yoga mat bags and carriers are CAREFULLY CRAFTED, made of STRONG MATERIALS. They are DURABLE and WELL MADE, out of THICK, HIGH QUALITY cotton canvas. With REINFORCED STITCHES and YKK ZIPPERS this yoga mat carrier will last a long time. The tote bag comes with a SIDE POCKET which is large enough to hold your water bottle and towel. There is also a second functional ZIPPER POCKET on the inside of the bag where you can SAFELY STORE YOUR KEYS, PHONE AND WALLET so you don't have to carry an extra bag with you. This versatile yoga mat carrier from Zenifit has a good chance to become your all-day companion. Forget about toting several bags around the town. Zenifit is so roomy that it can hold almost everything you might need for your practice – a yoga mat, a yoga block, a small towel, a water bottle and even a set of shoes or clothes. Spare the yoga accessories, and you will easily fit a pair of notebooks or other daily essentials. The owners of thick yoga mats will be pleased as well. Not only it is super easy to slip your mat inside, but the bag also comes with a set of free elastic straps that help keep it from unrolling. Don’t worry about the durability – this sling is strong enough to serve you for a long time. ‘If your shoulder can handle it, so can the bag,’ Zenifit founders assure. Made of thick, yet soft cotton canvas, it features reinforced stitches and a comfortable wide carrying strap. And if that’s not convincing enough, the company is offering a lifetime guarantee for their product. Thanks to a variety of colors and a classy embroidery design, Zenifit bag looks great everywhere: whether you’re heading to the studio, doing shopping or running errands around the city. Zenifit yoga mat bag is machine washable but, as any cotton-made products, is prone to shrinking. Wash it inside out in cold water and air dry to enjoy this stylish yoga accessory for a longer time. Fits any standard or premium mat up to 24" wide. 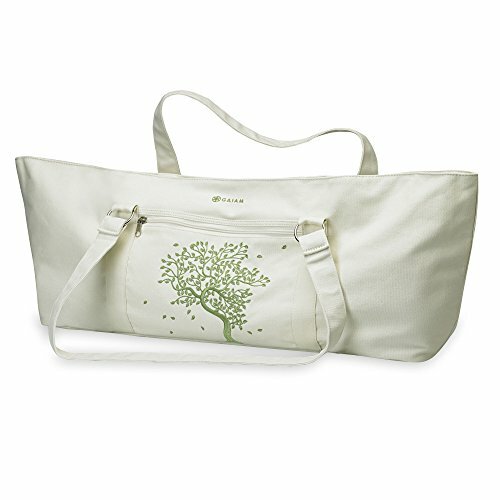 Gaiam Yoga Tote Bag is a stylish women’s yoga mat bag with an embroidered Tree of Life or Mandala on its canvas. It comes in white and brown colors and can be machine washed. The tote bag fits thick mats, but no wider than 24’’. The large main compartment leaves room for other essentials, such as changing clothes or a towel and is secured by three magnetic snaps. This can be useful when you’re in a hurry. Though mind that if you fit too many things inside of the bag, it would be challenging to close it. There are also two zipped pockets for holding smaller objects such as keys, wallet, etc. so that they wouldn’t fall out from the main compartment. Gaiam Yoga Tote Bag has the horizontal rectangle shape, and it might complicate the navigation through the crowd. 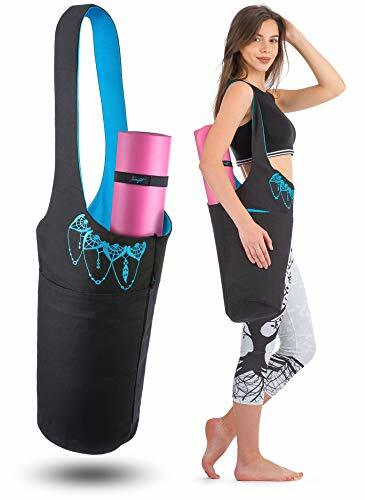 If you’re tired of carrying several things at once or your yoga accessories and personal items mix up in a big tote bag, then Hotdog Yoga Rollpack will fit you right. This bag-organizer is designed to conveniently hold your yoga mat, blanket, clothes, accessories, and personal items in separate compartments so next time you will find your ID and keys in no time. The Hot Dog Rollpack has 8 storage spaces: a clothing section, a mat sling, 2 padded pouches, separate secure pockets for valuables and a bottle holder. The bag can carry the mat of any size and thickness, even your Manduka Pro XL 82’’. Rest assured that your mat and clothes stored in the bag won’t get stinky even after the hot yoga session since the mat and clothing sections are ventilated. The clothing compartment also features a garment hanger hole where you can put the rack to prevent your clothes from creasing. On the downside, due to bag design, it might be a bit difficult to get to your clothes as you will need to take all the stuff out from the bag. Hotdog Yoga Rollpack is made of water-repellent and stain-resistant material, which is easy to clean and has 2 short handles and an additional adjustable shoulder strap. It is also multi-purpose. The Hotdog Yoga Rollpack is perfect to travel with: if you’re not taking your mat with you, just roll up a blanket or a towel and put it instead of the yoga mat. FAIR TRADE CERTIFIED Factory - Fair Trade Certified is, hands down, the best way to ensure a product is ethically and responsibly sourced. Fair Trade Certified ensures manufacturers go above and beyond in providing fair wages, safe working conditions, and creating environmentally friendly products. It also means a portion of the purchase price goes back to directly support the workers who made this product -- empowering them to better their communities. FITS ALL MATS UP TO 26" Wide - Designed to carry every brand of exercise mat. Added room to fit a yoga towel or other yoga props as well. Buy a yoga mat bag from Open Road Goods and let your conscience be clear. They are a Fair Trade Certified company, which means that they handle business in an ethical way by paying decent wages and creating safe working conditions and are also environmentally sustainable. 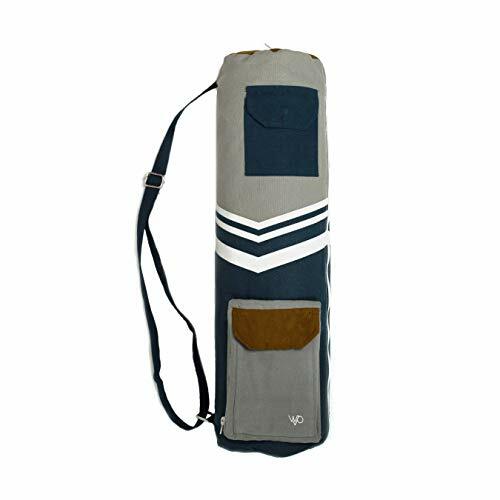 Open Road Goods yoga mat bag is made of certified cotton the processing of which met ecological and social criteria. It has a main compartment which fits mats of any size and width. In case your yoga mat is thinner, you might toss inside a pair of converse or a towel as well. There are three additional pockets for personal items and valuables. The strap is adjustable, but not padded. So it might hurt your shoulder if you’re carrying a heavy mat for a long time. Since the yoga mat bag is made of only 1 layer of fabric, it might be less durable than other products on the market. Llamaste is a small NYC based company founded in 2014. They own a yoga studio in Brooklyn as well as offer a range of yoga products such as yoga mats, yoga mat bags, props, and other accessories. The Llamaste set is made of water-resistant canvas which will serve you for years to come. The backpack includes a large compartment with pockets to hold your tablet or laptop, clothes, cosmetics, and accessories, and a side mesh for a water bottle. A separate laundry compartment with breather holes is designed for wet clothes and towels. An external pocket can be used as a holder for a smartphone or sunglasses. The set also features pull-top closure so no more cheap and broken zips! The great thing is that the mat bag is detachable and both items can be used separately. As a disadvantage, Llamaste set is pricey. Moreover, you may struggle with the balance while carrying both the yoga mat and backpack since the heavier object will weight you down either to the left or right side. Thus, this set might not be a good option if you’re riding a bike. What style of the yoga mat bag do you prefer? Share your opinion in the comments! I’d love some tips for carrying a mat on a bike rack. So far I think bungie cords will work but I’m sure I’m overlooking something. Yoga Sak might be exactly what you’re looking for. 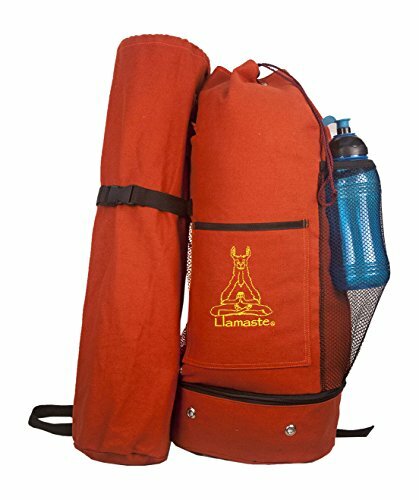 It is a backpack-style yoga bag. Thanks to its design, a yoga mat, which is usually the heaviest item you carry for yoga, is always placed in the middle so the weight you carry around all day is not skewed to one of the sides. I’ve also seen people using yoga straps instead of budgie cords. And since the strap is wide and smooth, there’s a smaller chance of leaving dents or scratches on your mat. I recently got the one from Open Road Goods and I love it. It has tons of space and I use the side straps to hold my mat. And they are eco-friendly too!